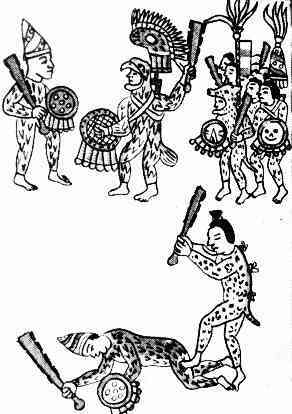 Much of what we know about the warfare in pre-conquest Mexico we know from Aztec warrior drawings and personal accounts of the conquest. When the Spanish first conquered the Aztecs, some of them took care to learn about the culture of the empire by having the native people write down various aspects of life, including warfare. The Spanish added their own notes to the works, and since then many others have attempted to interpret the history of the Aztec warrior in various ways. This page will just give you a few more drawings - a hint of what's out there. There was Aztec warrior art just in the way that the warriors dressed. The warriors dressed in various ways, often wearing a uniform of sorts that showed the group that they belonged to. An eagle knight would wear a stylized eagle helmet, for example. The warriors often wore protective gear, such as quilted clothing that impeded the spears and arrows of the enemy. Another group of warriors were the jaguar knights. See in the picture above one of the soldiers with a jaguar head and skin. 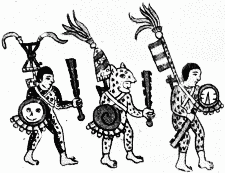 The soldiers are each carrying a maquahuitl, a common Aztec weapon. Warriors that distinguished themselves in battle could be a part of a ceremonial war. You can see here, the fighters each wearing clothing according to rank. Generally, the higher the rank the more elaborate the outfit would be. This last drawing shows a part of the conquest. The Spanish and their allies are to the right. 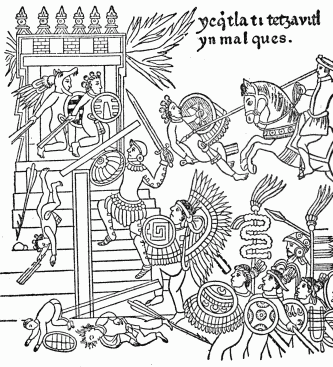 The Aztec warriors had made a stand on the temple, and were being overrun by the Spanish. Here are some Aztec warrior drawings on a primary school site. Also, see these Aztec warriors with captives in an article discussing Aztec writing. Check here to read more about Aztec warriors (and for more drawings).